How Do You Define Yourself? or Do You Let the World Define You? Lizzie Velasquez giving a talk at TedXAustin. Screen grab from YouTube.com video. One day I was just surfing around Youtube and trying to find some inspirational and empowering videos – and I chanced upon this video: https://www.youtube.com/watch?v=c62Aqdlzvqk . 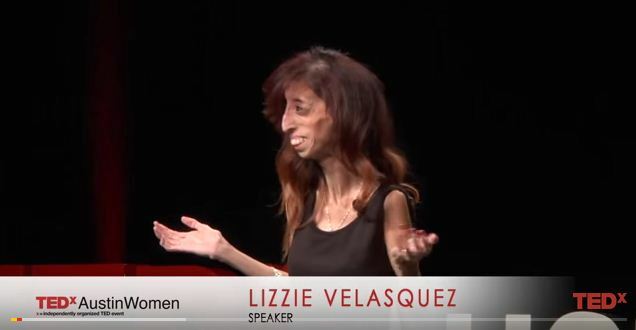 The videos’s title is “How do you Define Yourself Lizzie Velasquez at TedXAustinWomen”. It was a 13 minutes talk by a woman named Lizzie Velasquez who is a victim of a rare congenital disease since birth which prevents her from gaining weight. Lizzie currently weighs only 58 lbs. and has a difficult time gaining weight. Because of this and complications arising from this disease, she was ridiculed by her peers, including some netizens tagging her as “The World’s Ugliest Woman”. As horrible as this title sounds, Lizzie turned around this bad press against her to something good – she built up her confidence and became a motivational speaker, talking about how her situation has spurred her resolve to become kind to others and not to listen to other people’s perceptions of her as her foundation for her own self-worth. In the end, Lizzie became a most empowered person – succeeding in school, in society, in the online world – just by allowing herself and only herself to define her value in the world. I mention this story because I wanted to talk about one of the biggest mistakes we normally make, me included, of letting other people define our self worth, of what we should be. Most of the time, this starts from childhood – and unfortunately, are sometimes pushed forth by our very own parents, siblings, relatives, teachers – even bestfriends! Lizzie asks her audience this particular question: “What defines you?”. Is it your friends, your accomplishments, your academic titles (PHD., Master’s, Diplomate, Atty., etc. ), your money, the media, your position in the company, your beautiful face, your Louis Vuitton designer bag with matching shoes, etc.? If we let all the external and extraneous factors define us, then we lose out in this game called life. Because all of these things do not define us, nor should we let them define us. Good question! Perhaps we can start off with the quintessential question posed by paradigm-breaking author Eckhart Tolle who wrote the phenomenal inspiring book, “The Power of Now”. In a special TV episode of Oprah Winfrey’s O series, Eckhart Tolle asks this simple question which has made others and me thinking seriously. The question is: “Who you are not? I am definitely not my job nor my job title. If I leave the company I work for, then I will still have a sense of self-worth because my job does not define me. My possessions also do not define me. Car, condominium, house in the suburbs, designer wardrobe, vacation in Cannes, handsome millionaire boyfriend – these are not the things that define myself. So what defines me? What defines me is the fact that I’m a Divine Being created by One Source (or Our Creator) and sent into this world on a mission to serve others. All other things pale beside this declaration of being. What is important is what I represent and do for others. I do not say that I overlook taking care of myself so I can serve others. One must start with the SELF first before working on helping other people. The important thing is what we do in this world to benefit others. I brought up this topic because sometimes, we are besieged by this endless “chatter in our head” which drives some people even to suicide or to the brink of suicide. Let yourself remember that we are a “Divine Being”, created by One Source/The Creator to have a sole purpose in this world. And that purpose is for you to find out. All you need to do is “listen to your heart” – because that is where you came from, that is the real you. Only your heart knows truly what you want, not your head. So how about YOU – what defines you? This entry was posted in self improvement, self-empowerment and tagged anti-bullying, Knowing our self-worth, self confidence, spirituality. Bookmark the permalink.